Amazon just released its fiscal Q4 2014 earnings, reporting $29.33 billion in revenue, $214 million in net profit representing $0.45 per share. According to CNBC/Thomson Reuters, analysts expected the company to report earnings of $0.17 per share on $29.67 billion in revenue. While the company largely beat the expectations on earnings, it fell a bit short on revenue. For the past two quarters, Amazon unexpectedly posted losses. 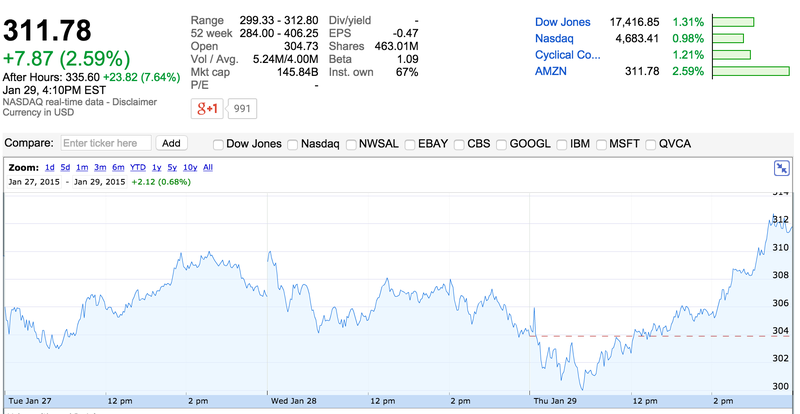 Three months ago, the stock market was very harsh with the company, pushing the stock down 10 percent. Now that Amazon is mostly back on track, the stock market is reacting very well. Despite falling short on revenue, minutes after the release, shares are trading up 7.86 percent in after-hours trading. Last year, Amazon reported $25.59 billion in revenue, and earnings per share of $0.51. Today’s release represents a 14.6 percent year over year increase for revenue, and a 11.8 percent decline for earnings. Amazon is still recovering from the release of the Amazon Fire Phone. After realizing that very few people were buying the company’s new phone, Amazon had no choice but to lower the price. You can find it for $0.99 every now and then. As a result, Amazon’s margins are suffering. But things are starting to look better. This quarter is an important one for Amazon. The company is finally reporting a net profit. First, the revenue is still greatly increasing year over year. While the company is investing heavily in research and development for new devices, Amazon is still first and foremost an incredibly successful ecommerce website. In particular, Amazon Prime is doing really well. Tens of millions of people around the world subscribe to Prime to get faster delivery and streaming services. The company can probably generate healthy margins on this subscription. “When we raised the price of Prime membership last year, we were confident that customers would continue to find it the best bargain in the history of shopping. The data is in and customers agree — on a base of tens of millions, worldwide paid membership grew 53% last year — 50% in the U.S. and even a bit faster outside the U.S.,” CEO Jeff Bezos wrote in the release. Other high margin areas include advertising on Amazon’s properties, the Amazon Appstore for Android, Amazon Instant Video and the Kindle Store. The company recently resolved its dispute with Hachette, meaning that Hachette books are back in the Kindle Store. This probably also helped. Now the company needs to be careful with its margins, but it will be interesting to see whether Amazon will try and release new crazy devices like the Fire Phone again. Amazon could spend a lot of time looking for the perfect device that could bring even more people into the Amazon ecosystem.